Adoption is the permanent emotional, social, and legal transfer of all parental rights from biological parent or parents to other parents or family. 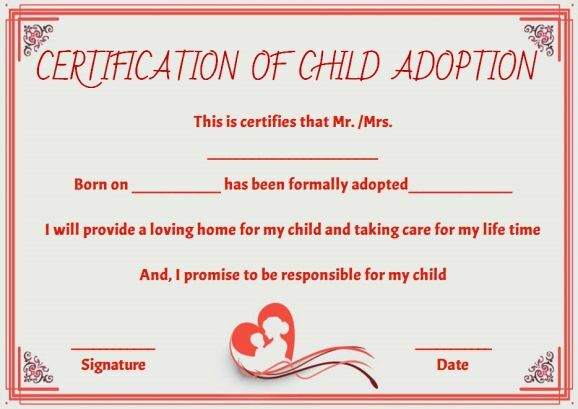 In detail, the child who is going to get adopted will not be raised by his/her biological parents and become full and a permanent legal member of the family (who is adopting a child) while maintaining a psychological and genetic relationship with the birth family. 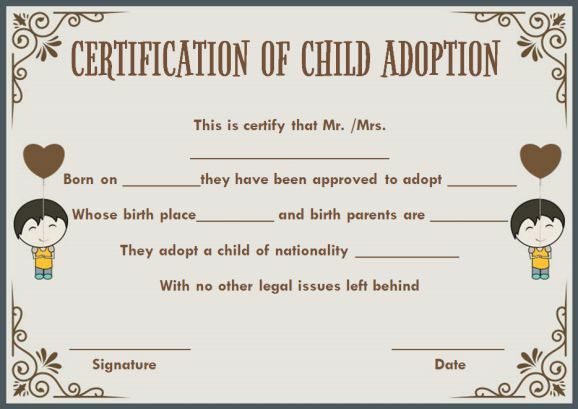 Are you willing to adopt a child or willing to know about the child adoption process? Then, you are on the right page. 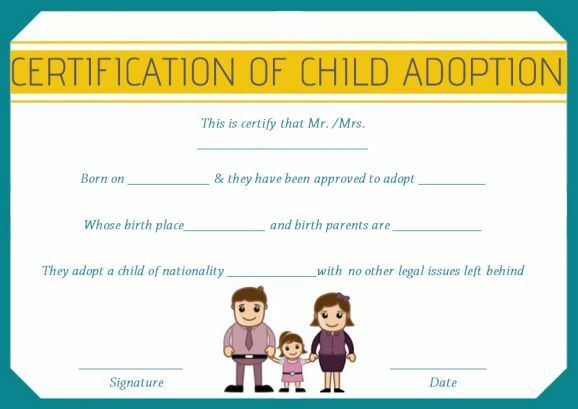 Read the following document to get complete information about Child Adoption process and certificates. 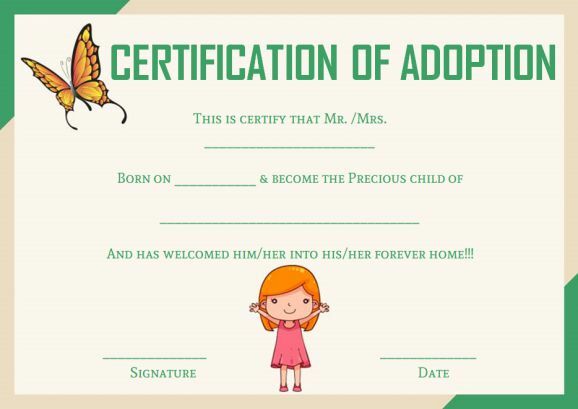 We also provide free and printable, professionally made child adoption certificate templates and legitimize the adoption for the child’s new family. 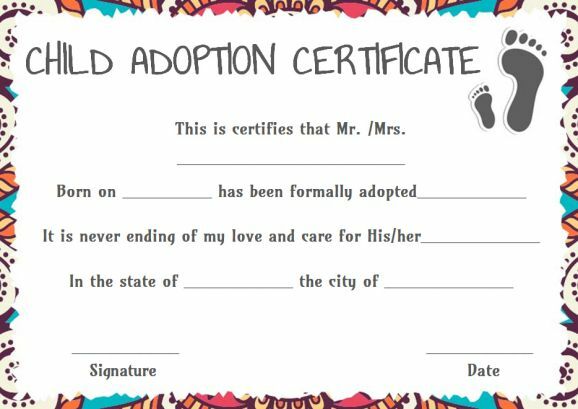 Instant download and easily editable certificates available right away from just a click… Have a look to grab our awesome collection of Child Adoption Certificate Templates. Child Adoption means the legal process through which the adopted child is separated from his/ her biological parents and permanently becomes the lawful child of the adoptive parents with all the privileges, rights, and responsibilities that are attached to a biological child. 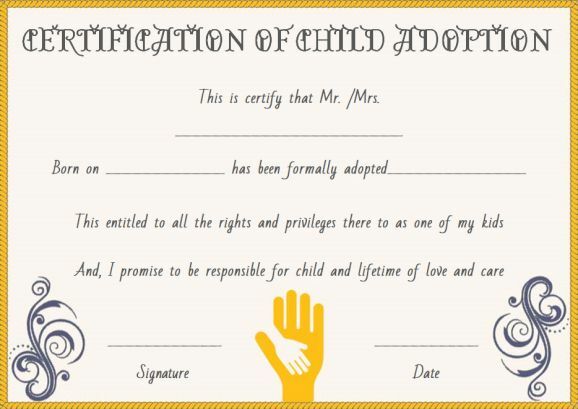 Child Adoption Certificate is the legal document or certificate given during the child adoption stating the complete details of the legal process with the sealed signatures of all the concerned persons involved in this process of adopting a child. Current family photograph/ photograph of the couple or person who is adopting a child. 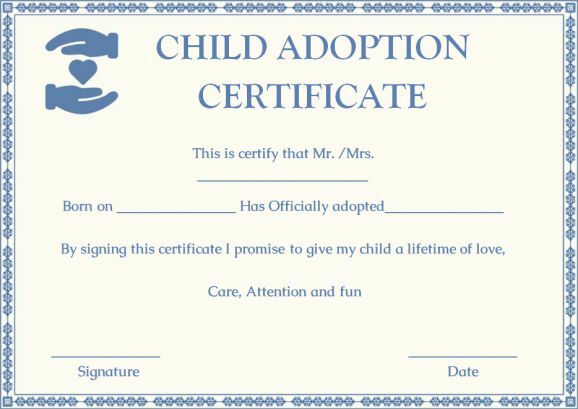 Birth certificate/Proof of date of birth of the prospective adoptive parents. Three recent postcards sized photographs of the adoptive family. Two reference letters from acquaintances or relatives in support of adoption. Divorce Decree/Declaration from the competent court or affidavit on oath pertaining to divorce in case of divorce governed by personal law where a decree of divorce is not mandatory/Death certificate of spouse in case of the single prospective adoptive parent (if applicable). 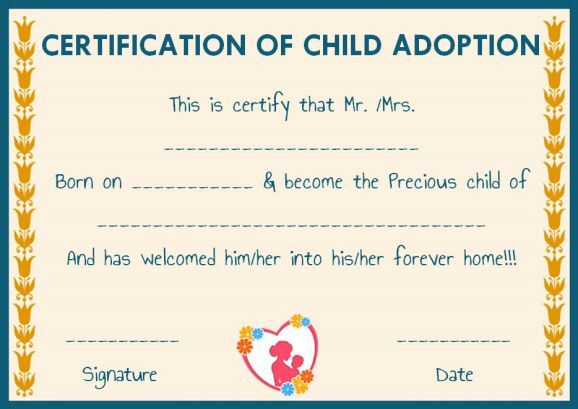 Adoption decree, if the couple has adopted child/children earlier. There are several options to the adoptive parents to adopt a child. Some of them are Domestic Private Agency Adoption, Domestic Public Agency Adoption, Independent Non-Agency Adoption, and International Adoption. International adoption and Domestic private agency adoption are bit expensive processes which may take several years to end the process. There are chances of involving the input of multiple agencies often during the process. Whereas, domestic public agency adoption can be less costly, but it is time-consuming and also require special training courses. On the other hand, Independent non-agency adoption is an easier option that put complete control of the adoption in the hands of adoptive parents where they have the option to select a birth mother and also negotiate the terms of the adoption. Each and every state has its own adoption laws. So, it is always better to contact a concerned attorney of your state before you begin the process. The job of a Social worker in this process is to study your home and make sure that the adoptive child has a safe and secure environment. He/ She will give a final report on home study summarising her findings. Talk to your friends, family, and co-workers about your adoption plans and ask them to pass along your contact information to any woman or birth mother who is interested to give her baby for adoption. Sometimes, advertisements do the job perfectly by placing ads online and in newspapers telling that adoptive parents are intent to adopt a child. It is an important step to keep in mind that to get consent from the biological parents before you adopt a child from them. Do not forget to take both the biological mother and father’s consent. If father/ mother is not available during the process, you should attempt to locate him/her and submit the documents of your effort to the court. Now, it is time to submit the legal documents or consent forms of both the biological parents to the court in order to get the legal rights. Once the court has received your legal documents i.e. 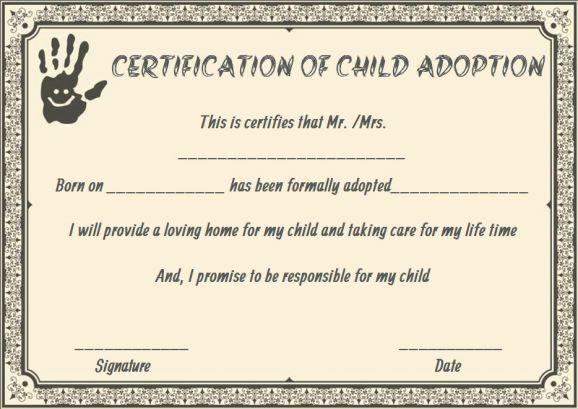 home study, adoption petition and consent forms, a judge will review your documents and issues a signed custody order. Once the child is in your care after all the legal process is done, a social worker must do 2-3 times visits to your home to check how you and the child are adapting to the new environments. These visits are called as Post-Placement visits. Following the post-placement visits, the concerned court and judge will assign you a hearing date. At this hearing, the judge will have another final review of your case and finalize the adoption, i.e. making you the legal parent of your new baby/child. 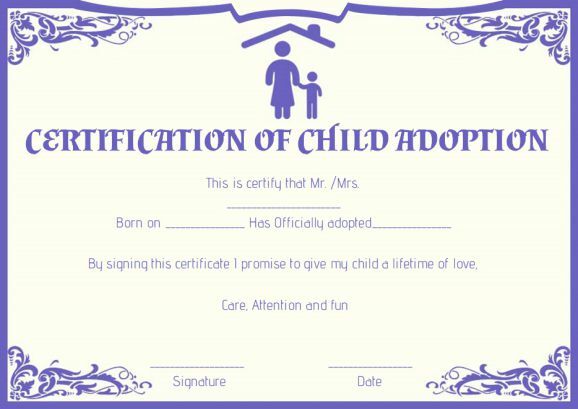 If you place an ad about your adoption plans, retain a copy of that ad in order to submit to the court. If you are planning to adopt a child who was the citizen of another state, then you will need special approval legally before you can take custody of the child. There are four types of adoption: Private Adoption, Public Adoption, International Adoption, and Relative Adoption (including step-parent adoption). Private Adoption is the process through which birth or biological parents or expectant parents are connected with an adoptive family through the help of an adoption professional or agency. Public Adoption is the legal process by which children living in foster care are connected with adoptive families with the help of the Children’s Aid Society. International Adoption is the process by which a family adopting a child from another country. Relative Adoption is connected to the adoption of a child by a step-parent or close relation. “Close relation” in this context is defined as a grandparent, uncle, aunt, great-aunt or great-uncle of the child. Any other relation has to proceed through the private adoption system. Yes, more information is provided about the child by most of the child agencies than they are able to provide on flyers, ads and newspaper article. But some of the child’s information is only shared with the prospective adoptive parents by the staff. No, once the adoption of a child is done, the biological parents do not have any rights or legal tie to the child. Yes, absolutely you can adopt a child from any state but should follow the rules and regulations of the particular state the child belongs to. There are two stages in the adoption process to finalize the whole process which takes around six months. Under both state and federal assistance programs, adoptive parents of children with special needs are eligible for a one-time payment of non-recurring adoption expenses that include necessary and reasonable adoption fees, attorney fees, court costs, and other expenses.